The Tables Vatel organized on Saturday, October 20, 2018, the second edition of its event ‘A Dinner in the dark’. We will take you through this innovative and educational concept, from the birth of the idea all the way through its execution, collecting the impressions of students on practicals. On 21 April, The Tables Vatel restaurant organized its first “Dinner in the dark” for the benefit of the GIHP (Group for the Integration of Physically Disabled People). Six months later, the School reiterated the experience. Why? How did the guests react? How does this concept enhance guest relation practices? ‘We are committed to training our students to perfectly serve each client, including guests suffering from a hearing, visual, mental or motor disability. Our blind dinner organized regularly at Tables Vatel with the help of the students on practicals and the participation of the association Group for the Integration of People with Physical Disabilities (GIHP) perfectly illustrates this desire, explains François De Laurens de Castelet, Co-founder & President of Vatel Bordeaux. The ‘Tourism & Handicap’ label we obtained in 2017 is also a confirmation of this strong commitment. • 7:00 pm: Our waitressing students and cooks are ready. 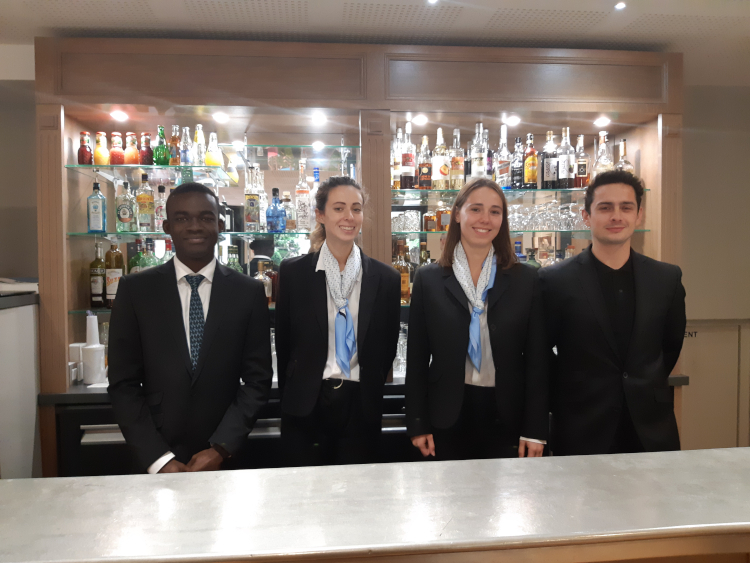 The student team consists of a barmaid (Valentine Langlois – Prépa B), a butler (Mathilde Ranchet – Foundation year B), a sommelier (Henri Rouvroy – Foundation year B) and waiters (amongst them Henri Konan – Foundation year B). • 7:30 pm: The first guests arrive. The students on practicals welcome them. The association GIHP, which is the main attendee of the evening, presents its work and mission. • 8:00 pm: The room falls into darkness. Guests put on their masks and the dedicated dining room team guide them to their table. • 08:05: Valentine Langlois, bartender, prepares pre-dinner drinks to be sent to the tables by the waiters. • 08:10- 10:25 pm: ‘Waiters explain to the guests the position of their dinnerware,’ explains Henri Konan. As for Henri Rouvroy, he informs us that “the selection of wine was focused on foreign wines mainly to diversify our guests’ wine knowledge’. • Guests start enjoying their tasty meal prepared by Chef Adrien Ferran. • The guessing game begins. On each table, one could hear the same questions on every lip: ‘What wine is that?’, ‘Did I finish my plate?’, ‘Can I have water because I spilled my glass?’ Failing to be able to see their dishes, some guests touch the content of their plates to try to recognize a texture or a form. 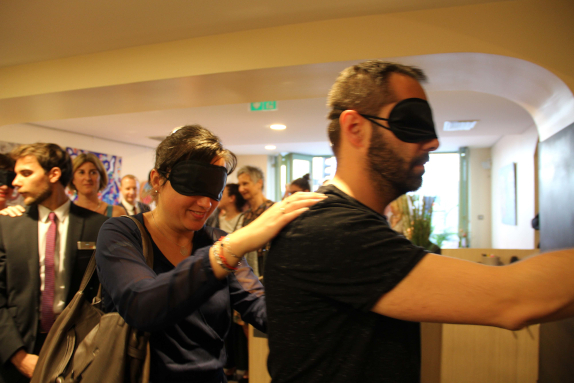 As meals are served one after another and wine glasses are uninterruptedly emptied and refilled, in a festive atmosphere, our guests’ sense are growingly awakened, which serves the objective of the event: make guests aware of the difficulties of vision impairment. • 10:30 pm: Masks fall off and our guests finally discover the dining room and are able to put faces on the names of the waiters who took care of them all evening. Upon departing, guests are handed a menu featuring all the photos of the dishes they had just tasted. In Vatel’s corridors, students of Foundation year B start a lively discussion: Henri Konan, Valentine Langlois, Mathilde Ranchet and Henri Rouvroy engage in a heated appraisal of the event. Everyone agrees that the attitude towards a guest is different during such a dinner. According to Valentine, ‘there is greater complicity between guests’. ‘Indeed, guests call us by our first names’, adds Mathilde. This experience makes our students aware of the visual impairment issue. Henri Rouvroy explains that “the evening helped him familiarize himself better with the challenges faced by the visually impaired’. 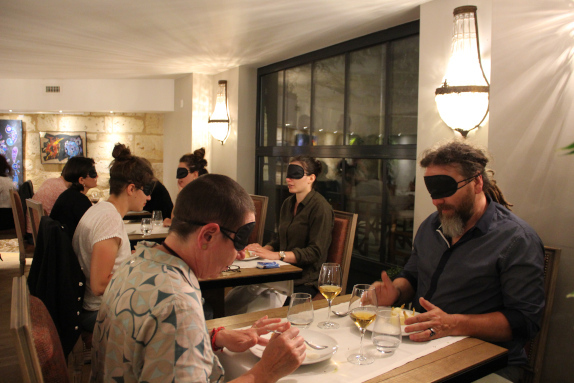 According to Henri Konan, the dinner heightens the overall sensory experience. ‘For instance, we had to guide some guests’ hands towards their glasses.’ adds Mathilde. This second edition of the Dinner in the Dark at Tables Vatel is a valuable professional experience for our students, trained to display an equal sense of service with all: ‘I am reassured because I know now how to better manage a restaurant service for visually disabled individuals.’ says Mathilde. All our students are looking forward to the next ‘A Dinner in the dark’.